The historic buildings collectively known as “The Golden Swan” have played an important part in Trenton’s history almost since their construction in the early 1800s. Located on Warren Street, one of the main shopping streets in downtown Trenton, they have housed a multitude of uses, including a variety of stores, an important 19th century newspaper, a synagogue, apartments and the tavern that ultimately gave it its name. Across the street, a lot formerly occupied by a gas station sat vacant, creating both visual blight and an unpleasant gap for both walkers and drivers. 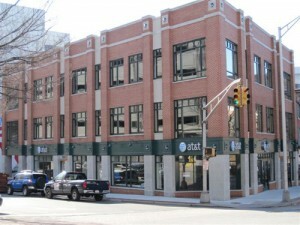 Both properties are located within a short walk of Trenton’s Marriott Hotel and the State House. 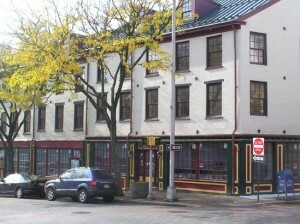 The Golden Swan sat empty and deteriorating until 2006, when the group of buildings was purchased by Woodrose Properties to serve as the flagship for that company’s historic restoration and adaptive reuse projects in Trenton. Woodrose then hired Clarke Caton Hintz of Trenton to complete a phased restoration and redevelopment plan for the site. When the redevelopment process began, the buildings were in extremely poor condition; a fire had damaged one apartment and there was water damage throughout. Woodrose Properties’ task was to take advantage of the wonderful history and character of the buildings, repair the years of neglect and damage and turn the Golden Swan into a modern, mixed-use complex. During the first phase of rehabilitation, the building’s exterior was carefully restored, the brickwork was repaired and repainted, a traditional metal roof was installed, historically appropriate/ energy efficient windows were installed and the storefronts were restored to more closely match their historic appearance. The completion of these two adjacent corners has now transformed the Warren Street corridor and added to its attractiveness and vitality. During the second phase, the interior was completely renovated to modern standards. The wood structure was repaired and reinforced, new systems were installed and a new elevator and lobby addition was constructed at the rear. The building—now completely handicapped-accessible, wired and energy-efficient—houses retail uses on the ground floor, offices on the second floor and loft-style apartments on the third. After completing the Golden Swan project, Woodrose Properties undertook the infill construction on the vacant lot across the street, creating two floors of office space as the state headquarters for the Communications Workers of America and a retail store on the ground floor. Also designed by Clarke Caton Hintz, this new building required a keen eye and careful planning, as the irregularly shaped lot was bounded by a historic structure on one side and needed to fit with the character of the historic district. Using brick, glass and trim features, the structure fits into the neighborhood and fills what had been an eyesore in the heart of the downtown with an urbane new structure.